This only modern obelisk in Rome was erected by Mussolini himself and bears the words "MVSSOLINI DVX" („Mussolini, the Leader") and the marking of the Italian Fascists. This "Obelisco di Mussolini" stands in the centre of the Foro Italico, which was originally known as the Foro Mussolini. The obelisk is erected out of Carrara-Marble and weighs as estimated 300 tonnes. At the top a golden point is fixed. After the Second World War, all memorabilia to Mussolini were removed. 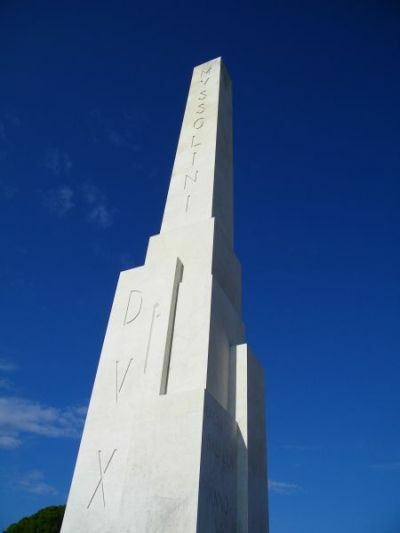 It was impossible to delete the writings on the 17,40 metres high memorial and so it stayed as the only public commemoration to Benito Mussolini.